Pegasus is easy to find when you spot the Great Square. On December evenings, as soon as the sky becomes sufficiently dark to see the stars, a cosmic configuration can be seen that people unfamiliar with the sky often mistake for the Big Dipper. Big it is, but — at least in an official sense — a dipper it is not. This large figure, known as the Autumn Dipper, is not usually described as a "dipper" in most stargazing guides; you shouldn’t expect to find any recognized authority for the Autumn Dipper. When starry dippers are mentioned, most people immediately think of the Big Dipper and the Little Dipper in the northern sky, and perhaps even the lesser-known Milk Dipper in Sagittarius. In truth, however, the Autumn Dipper looks like a much larger and brighter version of the Little Dipper. The Great Square is not a perfect square, instead appearing slightly battered out of its true square shape. Pegasus actually supplies only three stars of the Great Square: Markab, Scheat and Algenib. The fourth is Alpheratz, the brightest star of Andromeda. The "handle" of the Autumn Dipper is composed of stars belonging to the constellations Andromeda and Perseus. Alpheratz, Mirach and Almach are almost evenly spaced toward the northeast and are the brightest stars in Andromeda. 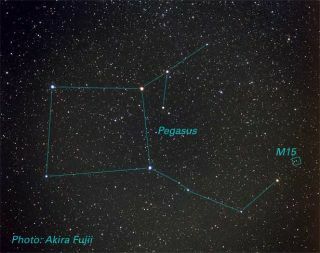 The next bright star, located along the same line, is Marfak (sometimes spelled Mirfak), and is the brightest star of Perseus. Two of these four stars (Alpheratz and Markab) are valuable navigational stars. Pegasus is, of course, the famed winged horse of Greek mythology. He has been found on ancient tablets from the Euphrates Valley, and on Greek coins that were minted during the fourth century B.C. In legend, Pegasus was born from the blood of the gorgon Medusa, when that monster was slain by Perseus. When Pegasus was brought to Mount Helicon, one kick of his hoof caused the spring of Hippocrene — a source of inspiration for poets — to flow. In another tradition, Pegasus carried the thunder and lightning for Zeus. Old star atlases that use allegorical drawings depict Pegasus turned over on his back with his body outlined by the Great Square. It is truly a masterpiece of imagination, not just to be able to trace out the constellation, but to be able to come up with such a fanciful beast. Today, of course, the logo depicting a red-colored Pegasus remains among the most recognized corporate symbols in American petroleum history. Interestingly, one of the stars in the Square — Alpheratz — actually belongs officially to the princess Andromeda. According to legend, Andromeda should be chained to a rock. Instead, she seems to have become chained to the horse: a double strand of stars — one strand bright, the other dim — connected to the upper left corner of the Great Square. About midway and above these star strands, in the Andromeda Galaxy, lies one of the most amazing and fascinating sky objects. In the year 905 A.D., the Persian astronomer Al Sufi drew attention to a "Little Cloud" amidst the stars of Andromeda, which appeared on star charts long before the telescope was invented in 1609. If the sky is clear and moonless, an elongated hazy patch can indeed be seen with the unaided eye. The "cloud" is about as long as the width of the full moon and about half as wide. Through binoculars and telescopes, it remains an elongated patch which gradually brightens in the center to a star-like nucleus. This strange patch was listed as object number 31 in Charles Messier’s 18th century catalogue of nebulas, which is why it is known as Messier 31 or M31. The best way to positively identify the Andromeda Galaxyis to focus your eyes or binoculars on the star Alpheratz. Run straight across to the left and get the star Mirach in your field of view. Then move slowly upwards to a fairly bright star above Mirach and continue to move up in roughly the same direction and same distance. You’ll immediately take note of a little patch of faint light. Congratulations! You’ve found Messier 31. Please forgive this patch of light for being so faint and tired looking. You will when you realize that, as you see it in the night sky, this light has been traveling some 2.5 million years to reach you (give or take a few hundred thousand years). The light from M31 began its journey around the time of the dawn of human consciousness. When it began its nearly 15-quintillion-mile journey earthward (15 followed by eighteen zeros! ), mastodons and saber-toothed tigers roamed over much of pre-Ice-Age North America, and prehistoric man struggled for existence in what is now the Olduvai Gorge of East Africa. In 1924, astronomers Edwin Hubble (1889-1953) and Milton Humason (1891-1972), using the 100-inch reflecting Telescope at Mount Wilson Observatory became the first people to resolve M31 into individual stars. We know today that this "little cloud" is actually a spiral-shaped aggregation of perhaps a trillion stars. This great island universe is the nearest of all the spiral galaxies and one of the largest known. Interestingly, our Milky Way galaxy is expected to collide with M31 in 3.75 billion years, eventually merging to form a giant elliptical galaxy. The fate of the Earth and the solar system, in the event of a collision, is currently unknown. If the galaxies do not merge, there is a small chance that the solar system could be ejected from the Milky Way, or could join M31, astronomers have said.